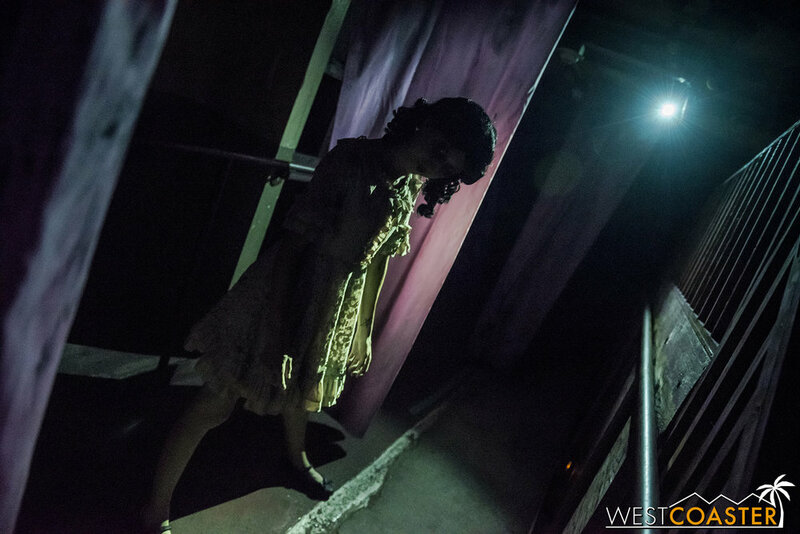 Our month-and-a-half long trek into the deepest, most sinister recesses of the Southern California haunt scene continues with a visit to the only haunted attraction in SoCal that can boast being located at a place that is actually haunted (I said SoCal, Winchester Mystery House)! 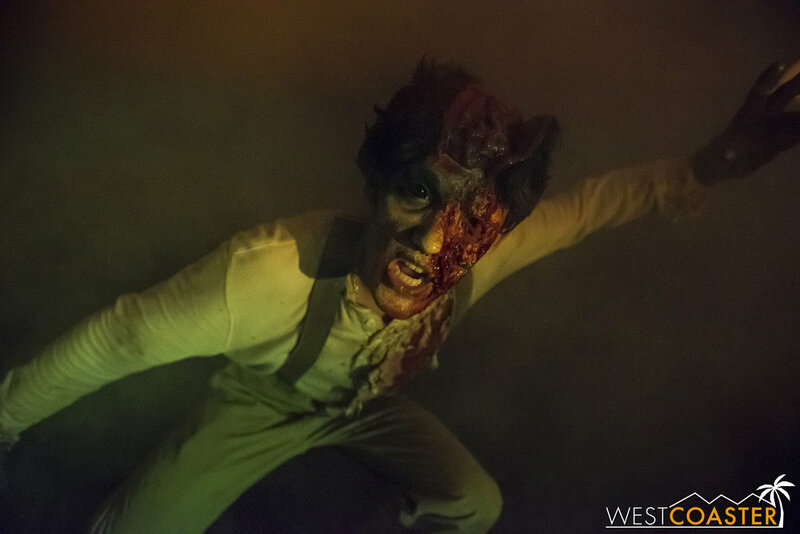 Last weekend, the Queen Mary’s Dark Harbor event kicked off its 2018 run with an impressive and enthusiastic salvo, showcasing a refocused direction, a grander cast, and significantly improved mazes and attractions for this year. Circus, which has a rethought concept this year. 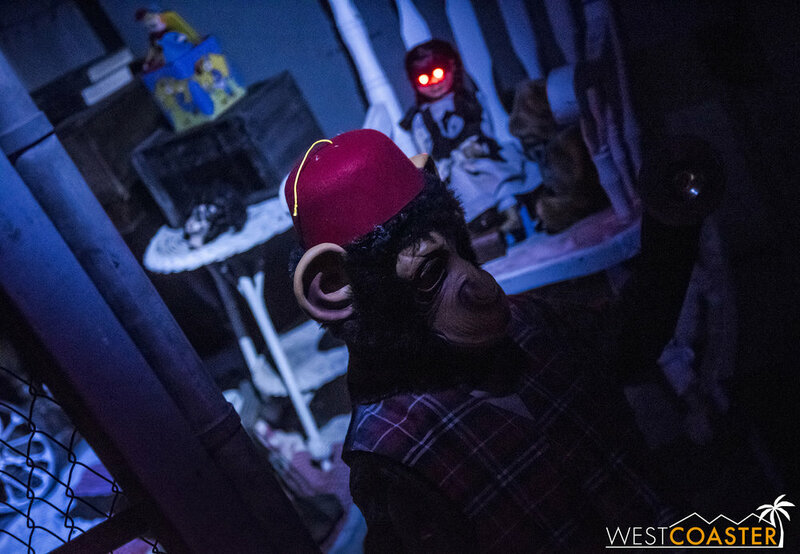 In looking at the mazes overall, while the level of theming generally works for what Dark Harbor presents, I'd like to see the detail and quality increase in the future. 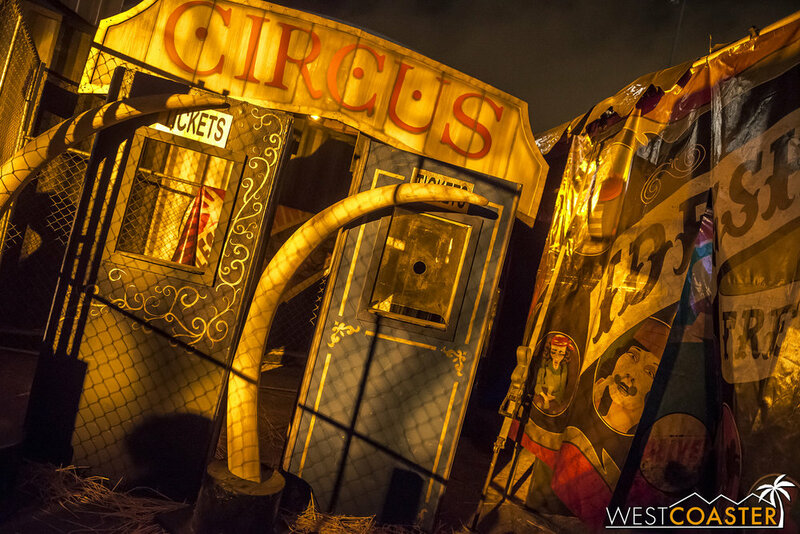 Dark Harbor has always had a bit of a carnie function... sort of like a home haunt on a widespread and more elaborate scale. Because of their smaller operations and budget, Dark Harbor has never paralleled the detail and intricacy of Universal or Knott's, which has largely been fine. 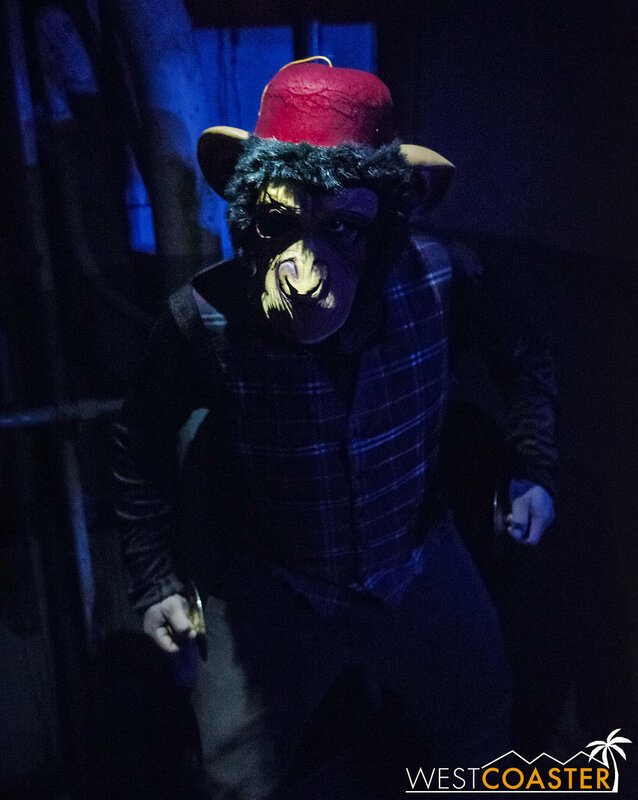 In the past, Dark Harbor's mazes were unique because guests were sequenced in via small groups, and it really felt like one was alone while going through, rather than lumped into a haunted line like Knott's or Universal get on busy nights. This added to the creepiness and suspense of the experience and made for some truly epic startle scares when the conditions were right. However, as Dark Harbor has become more and more popular (I think deservedly so, from prior reputation), the "alone factor" has reduced, and the mazes have become a little more crowded and backed up in order to mitigate the lines (which remain bountiful; I always recommend front of the line for Dark Harbor, since it isn't much of an upcharge compared to the other haunts). And as places like Knott's and Universal and even Six Flags have upped their games with maze design, Dark Harbor's theming is now starting to feel a little more noticeably inadequate. 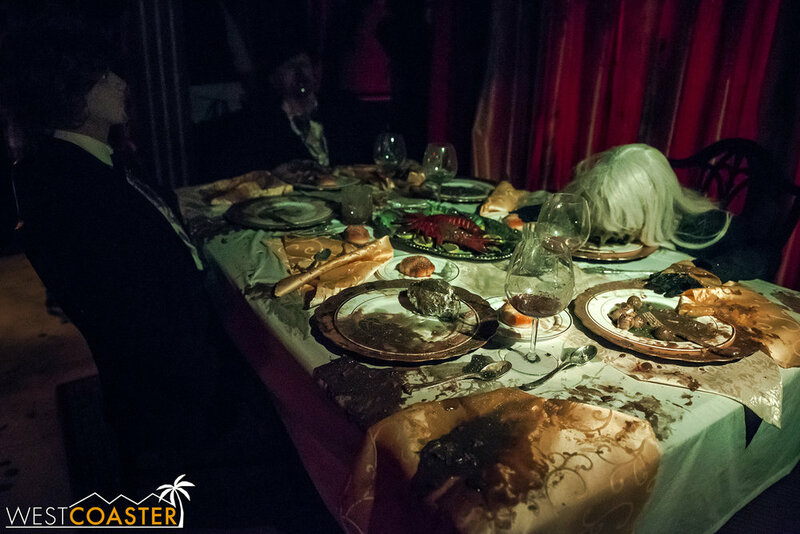 A lot of the props are items that could be purchased at a Halloween store, rather than custom designs or creative integrations into the ship or sets. Plus, this year in particular, we noticed glaring details like very plainly visible speakers in numerous mazes that did not seem to even have been attempted to be hidden. As a result, I can foresee a future in which Dark Harbor starts slipping in comparison to its SoCal "Big Four" brethren when it comes to overall quality. Well, after experiencing this year’s reconfigured mazes, I can definitely attest to the positive impact of the “Cooke factor.” With his design and construction outfit, Plague Productions, in tow, Jon Cooke has provided a layer of sophistication and sheen on top of the Dark Harbor set design, adding fabricated set pieces, improved lighting, additional integration of audio/visual effects, greater soundscape attention, and refined stories to the mazes at this year’s Dark Harbor. 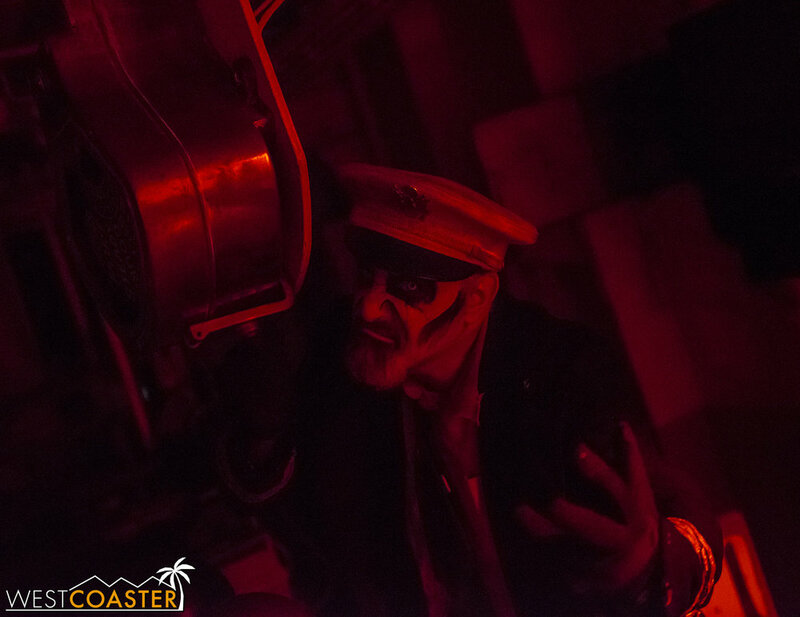 And while the changes aren’t complete cure-all’s—there definitely areas of some mazes that even Cooke himself would say require additional work—the updates we saw were a breath of fresh air to the actual haunted attraction line-up, which had definitely grown a bit stale in recent years. Intrepid turned out to be a pleasant surprise and huge improvement this year. One of the first things the Dark Harbor team appeared to do this year was review the maze line-up and actually cut a maze from the overall list. Soulmate was the unfortunate victim, sending Graceful Gale off into the streets as a roaming character as a result. 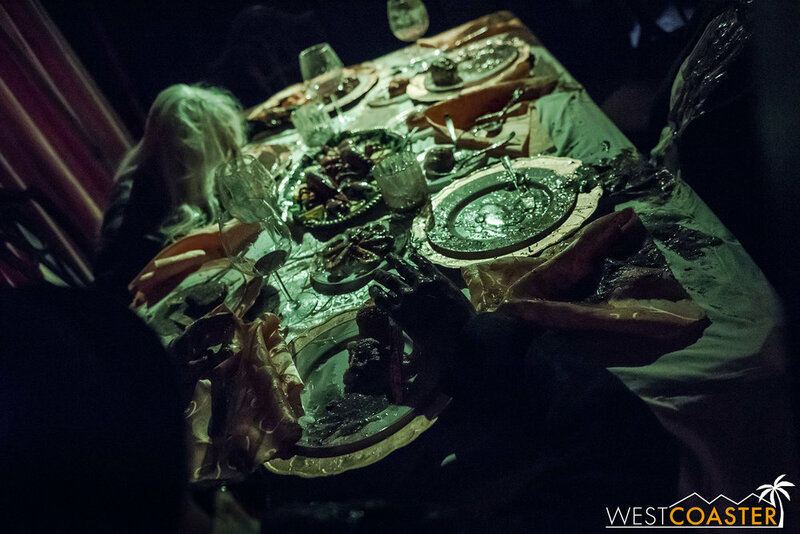 Feast was moved over to the old Soulmate location at the bow of the ship, while in its place at the stern, a new theater was constructed for Aiden Sinclair’s new “Illusions of the Passed” residency magic show. Though the total number of mazes shifted from seven to six, this proved to be addition by subtraction, as more attention could be paid to each of the remaining mazes—three on the ship and three on the parking lot—to increase the density of improvements. Deadrise, with the actual Queen Mary visible beyond. Additionally, under Cooke’s oversight, the stories of the six mazes were tweaked to give a more overall consistent tone together as well as inject some fresh life into areas that have grown stagnant. The amount of storytelling change varies. In some mazes, the alterations were more detail oriented to plus targeted aspects. In others, the background was revised to somewhat retcon the maze lore. And in still others, the storyline was shuffled to better suit previously revised maze progression, then synergized with additional maze design refreshments to give a more improved product. A moment from the significantly retooled B340 maze. The end result was improvements all across the board—sometimes drastically so. 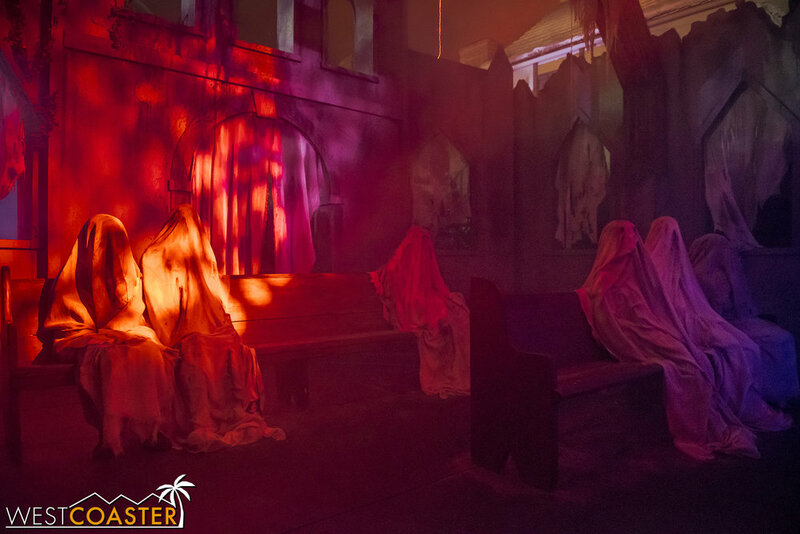 The construction of new sets (where those occurred) also revitalized the mazes, lending more originality to lessen that “purchased at a Halloween store” feel that I remarked upon last year. Lighting also seemed much more focused and intentional. And to our relief, those dastardly visible speakers at seemingly ever corner last year—tucked away this year and largely unnoticeable except by those actively seeking them out. Details like this matter, because they set the tone for the level of quality expected to be provided. Two years ago, when Intrepid first debuted, we were sorely disappointed at what simply felt like a very uninspired design and lazy effort at storytelling. Though there were isolated moments that were visually appealing, the maze itself seemed to rely on a crutch of having two layouts… and not much theming or correlation to the story of the cursed ship builder of the Queen Mary. After “disembarking” from the train at Edinburgh Station, guests arrive at a frosty church cemetery, boldly and dramatically presented. Guests filter through the church and church pew pews. Changes and a location change last year did improve the maze, giving it directon and a storytelling journey wherein guests boarded a train on a supernatural journey that brought them to the Scottish highlands where the Ironmaster grew up and into some of his old stomping grounds. But the maze also felt schizophrenic, with sudden changes of scenery that did not seem to make apparent sense as one progressed through the course. A hideous banshee emerges from the mist of the Scottish swamps. The solution this year: re-write the story, and enhance the maze with new and spectacular sets, control the sequence and flow through the layout, and bring tension and relief in series to manipulate the guest reaction and experience. The result: Intrepid was the surprise of the night and at or near the top of many people’s lists. Bodies, all wrapped up ritualistically. 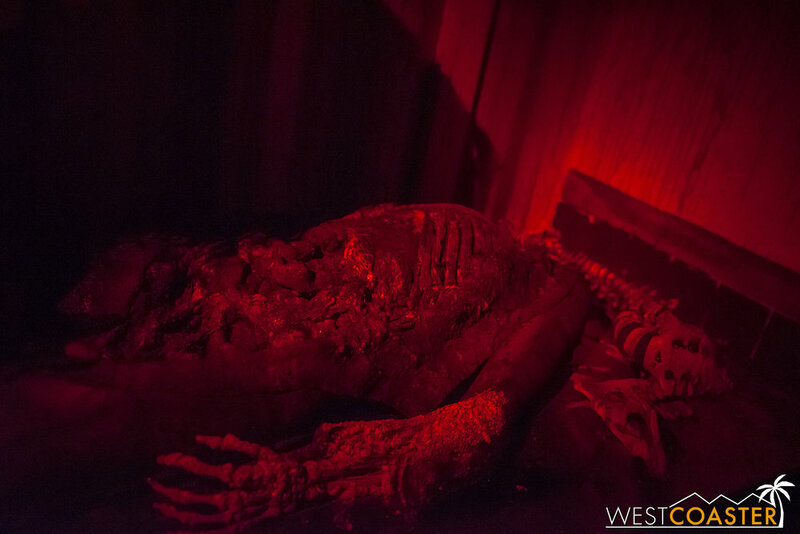 True to the original premise of the maze, guests’s board a train and are transported back to old world Scotland. But upon disembarking, they enter an eerie churchyard—the first noticeable change of the maze. This spectacular scene, dramatically lit and accented by drifting “snowfall,” is amplified by some wonderfully effective statue scares in the yard and inside the church itself. 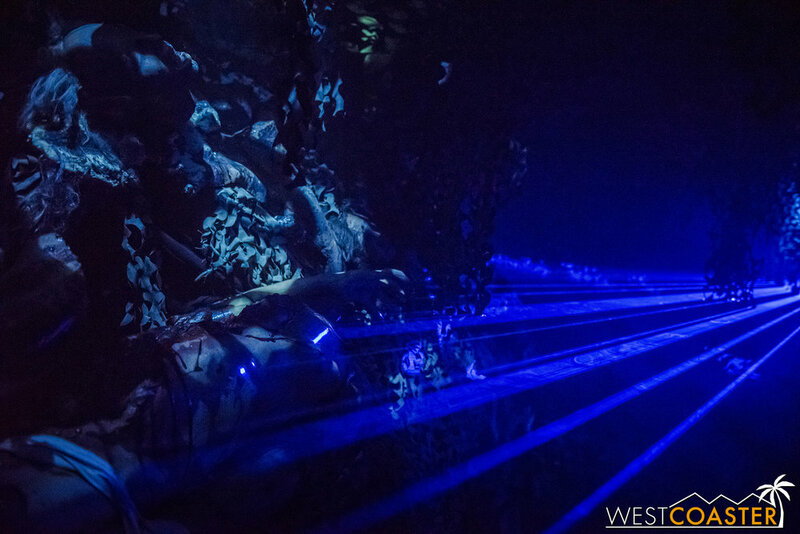 From there guest, proceed past a crypt before exiting into the heart of the highland bogs—home to last year’s most spectacular “green room.” This disconcerting “swamp” uses a swath of green lasers to create a plane of “water” that guests must navigate. Of course, lurking just beneath the surface are horrific banshees who consistently popped up and produced wildly effective jump scares. It was thoroughly entertaining to simply watch the monsters do their work, taking an effective setting and bending it to their control. 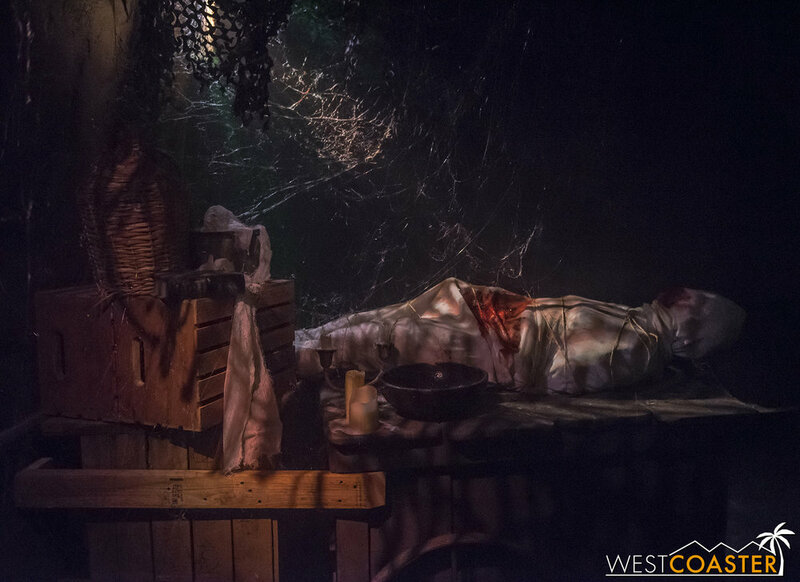 Though other mazes have done this since we first saw it at Dark Harbor last year (Cooke’s new Knott’s Scary Farm maze, The Depths, even lifts this in their own swamp room), Intrepid remains the maze that executes the concept most effectively. The Ironmaster engages guests right before they escape Intrepid. From there, it’s onward through an additional series of chambers filled with bones and corpses and the victims of the Ironmaster’s bloodthirst—the consequence of his pact to gain immortality. The progression from a brightly lit space to incredibly dark and foreboding ones really stresses the anxiety level, and this play produces a terrific (horrific?) psychological progression through Intrepid. From my understanding, Intrepid is the maze that received the most attention from Plague Productions. And it clearly shows! A definite well done here! A personal favorite of mine, Deadrise has long been the maze with well coordinated, expertly timing, aggressive and menacing monsters that compensate a hit or miss maze setting. Some set pieces, like the towering ship hull that marks the maze entry, are thoroughly awe-inspiring, while other parts of the maze can be somewhat rudimentary—just a series of fencing or barrels to provide a sort of industrial setting to navigate. But the talent makes up for the shortcomings, acting every bit like the savage crew of The Captain that they’re supposed to be. 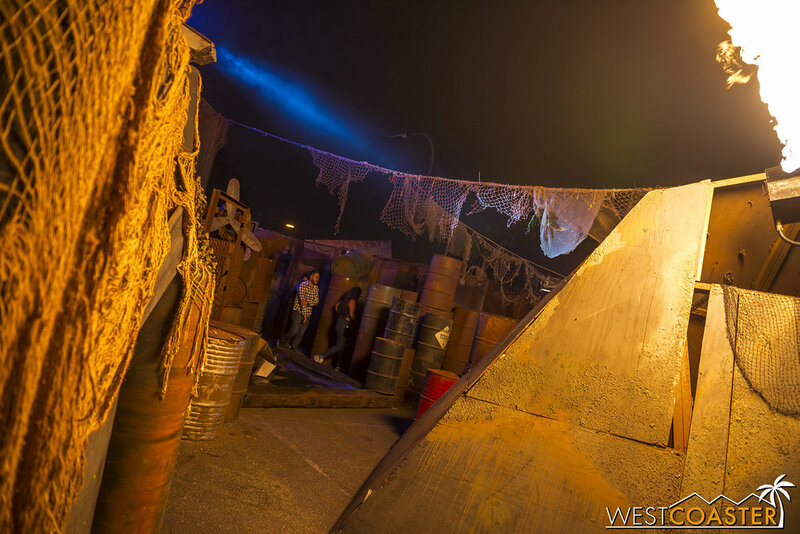 Longtime Dark Harbor guests may notice new Deadrise props recycled from old mazes like Containment. Guests who turn left at a fork in the maze can go up a short “obstacle course” consisting of a climbing net going up and a slide or pole going down. This year, Deadrise’s changes come more in parts. A new “electrical room” provides some triggered startle effects, while a brief “obstacle course” option yields some a fun playground moment (as well as this year’s “how did they get that past their lawyers? ?” moment). There are also segments new to the maze that contain familiar props and theming from other, bygone mazes. Deadrise also features a hidden bar, accessible at a location featuring a graphic icon matching one of six tokens guests might receive by interacting with street monsters or bartenders or performers. 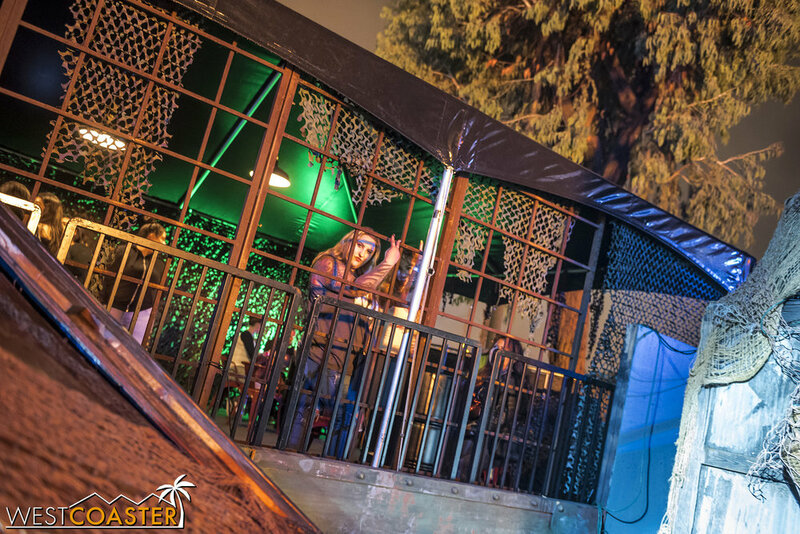 Of all the hidden bars, this one is the most fun, because it is perched on a balcony overlooking the maze, and it features a couple of trigger elements that allow guests to control select effects in the maze! Remember the water barrel that seems to always have a tendency of erupting when guests pass by? 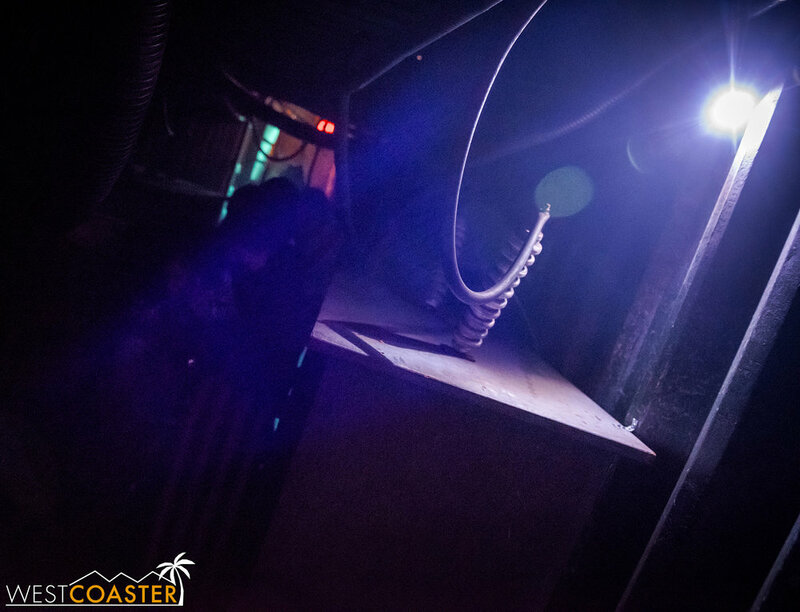 It’s under control by guests in the secret bar (and it’s always been remote controlled by maze operators, not set on a timer). Another effect shoots a blast of air at passers-by. It’s a fun and sadistic way to allow guests greater interaction with the maze environment. Undead sailors lurk everywhere in Deadrise. 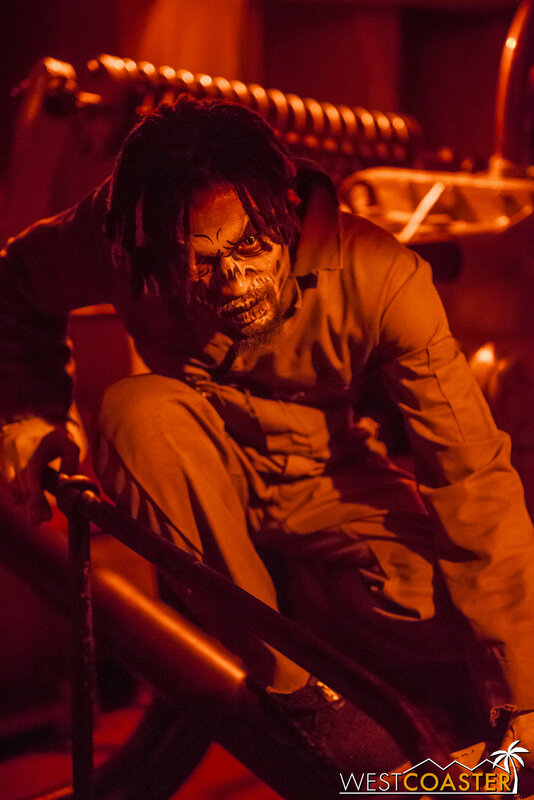 Of course, Deadrise wouldn’t be Deadrise without its memorable, fog-filled shipping container tunnel finale, in which guests exiting the maze, blinded by the light, face one final scare. Even if they know it’s coming, the guests inevitably are taken aback by the snap startle of the waiting monsters, who hit their start scares with precision proximity and timing. Once again, Deadrise rises from the depths to deliver a thrilling experience. Deadrise’s ending remains unchanged after all these years, but if it ain’t broke, don’t fix it. 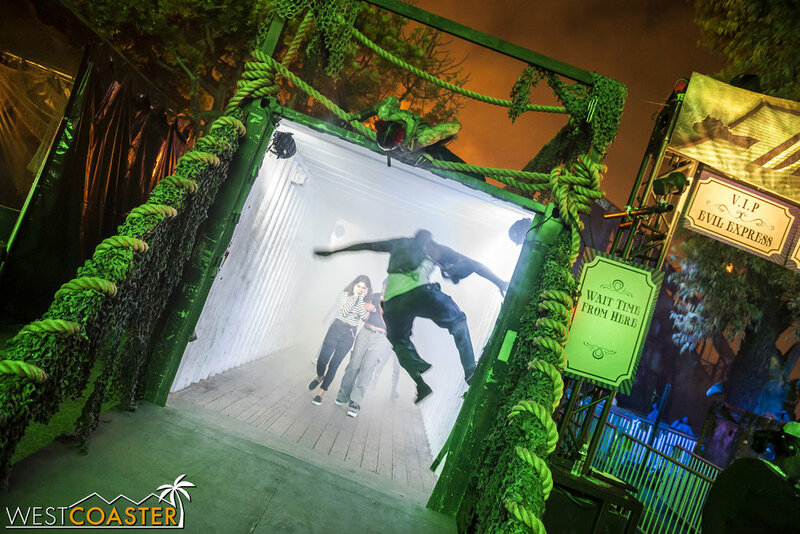 The fogged out, blinding shipping container finale always generates screams and surprises, as the veteran monster crew has timed their scares and jumps perfectly. 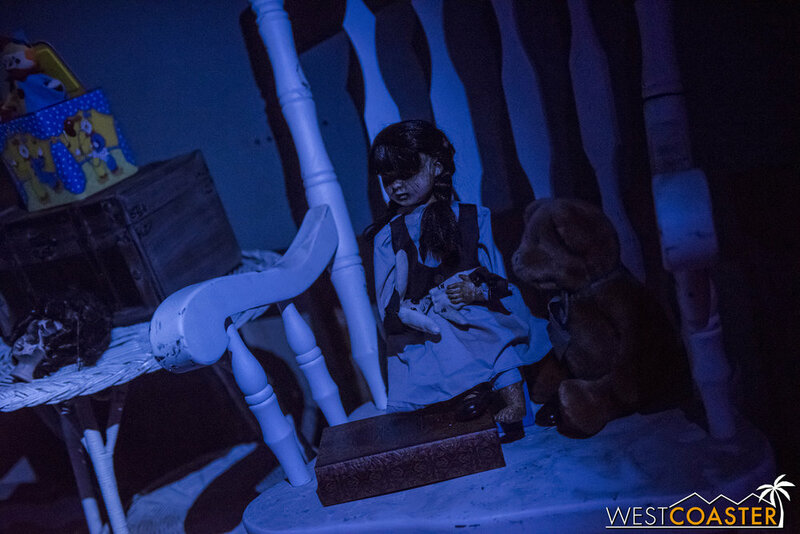 Among the three ship mazes, Lullaby remains the creepiest and most entertaining. 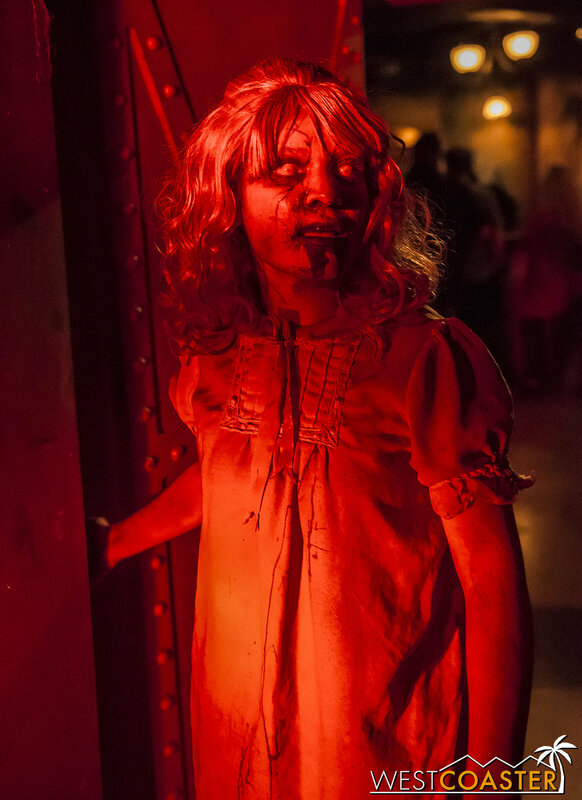 Home to Scary Mary, this maze brings guests along for a story about the Queen Mary’s youngest spirit, whose tragic death masks a backstory that is not as innocent as one might believe little Mary to be. Guests encounter Mary countless times throughout Lullaby. Though the layout remains roughly the same as last year, the theming elements in Lullaby have been switched up this year. Sometimes, the Mary’s come in waves. Storyline-wise, Lullaby has changed very little this year. Becoming familiar with Mary’s more monstrous and evil side is simple and effective and doesn’t require fixing—especially considering that the cast of Mary’s is deliciously creepy and effective. However, in contrast to the sometimes [darkly] whimsical ton of past years’ iterations, this year’s Lullaby carries a darker more sinister tone throughout. Mary is petulant, impulsive, and deadly, and she wants to play with you forever. Lullaby contains a… not-secret bar. It’s just a regular bar that is literally on the maze path. From the maze design side, Lullaby has undergone select scene improvements, with more intentional lighting, different illumination effects, and some rearrangements in props. But it’s still creepy as hell, and the actresses throughout the maze are delightfully malevolent. The finale is not quite as climactic as past year’s, and I still miss actually walking past the old swimming pool where real-life Mary was alleged to have drowned. But the maze overall remains a highlight . Imagine a ghostly demonic child at the end of a hallway, dimly lit, revealed only by the occasional pulse of a green strobe. 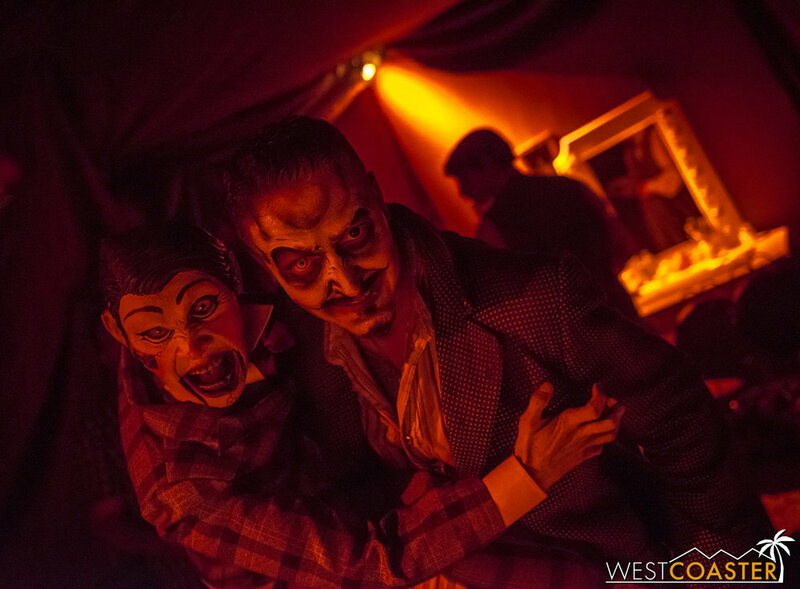 The third of the non-ship mazes, Circus has long served as Dark Harbor’s “clown maze,” bearing greater tie-in to the ambiance of the event than even the ship-based mazes. 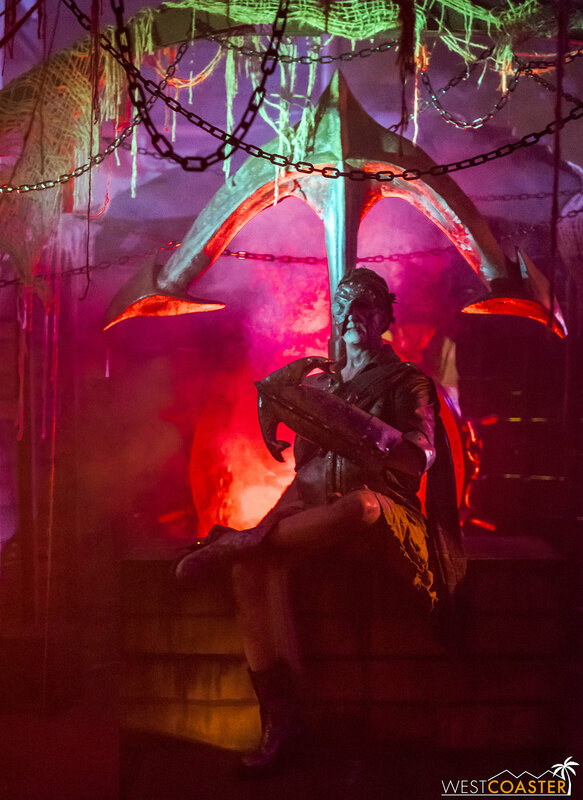 For even though Dark Harbor’s legend revolves around the grey history and fantastical stories of the ship’s past, the overall haunted attraction is ultimately a scary carnival of freaks and ghouls—right down to the way stalls and stands are laid out, and how street talent and entertainers distribute throughout the grounds. A barker heralds a branch in Circus, where guests can go one of two directions and encounter a different experience in each. 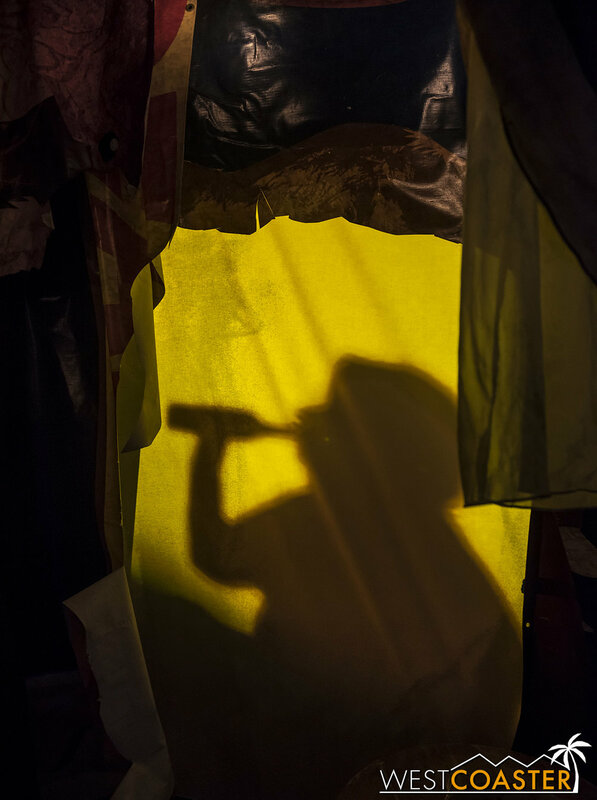 This year, Circus has been reimagined as a darker carnival that guests happen upon and sneak into (much to their regret). But the performers they encounter within are far from gracious. It turns out that they’re rather maniacal themselves, and they do not hesitate to play with their victims’ lives. The ball pit is back!! Of course, it had to return due to popular demand. 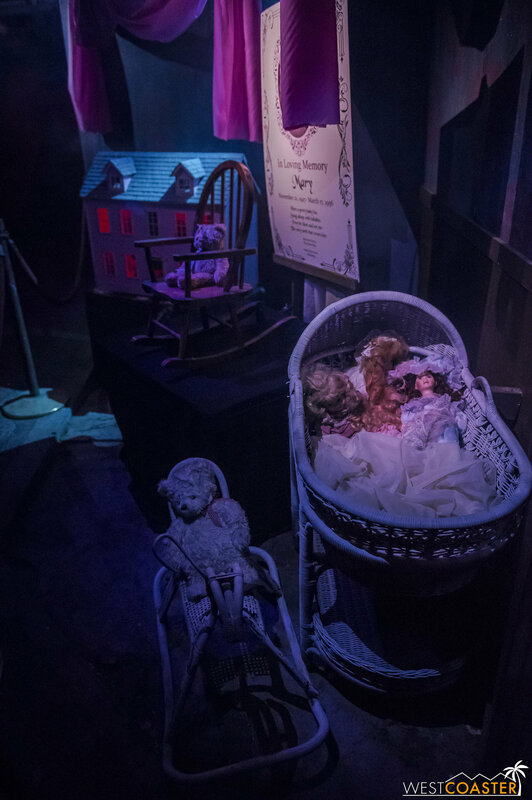 Intentionally or not, there is a similarity in tone to Jon Cooke’s Dark Ride maze at Knott’s Scary Farm—in that carnies have taken over a place that guests should not have entered and made it their own. 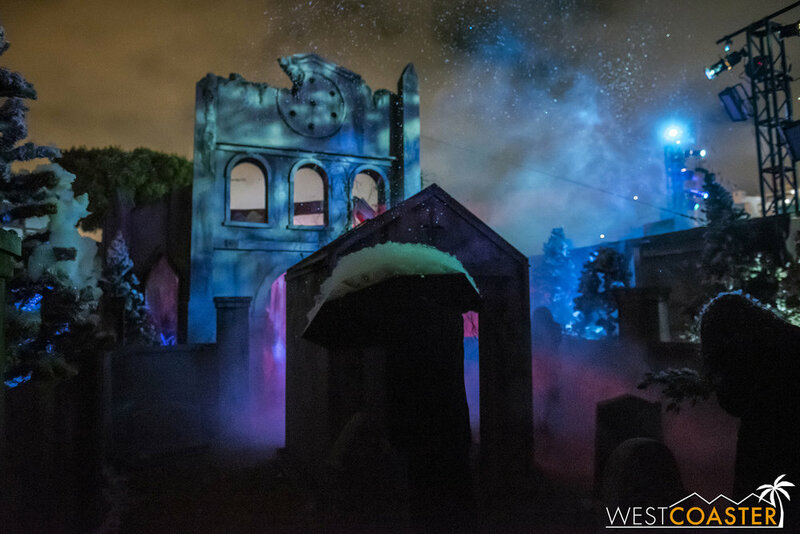 The layout has changed significantly from last year, making it feel relatively fresh, and provided that guests don’t happen to time their walk through the maze during a down period with multiple cast breaks, the monsters thorough Circus echo a nervous energy that is befitting of crazed clowns. 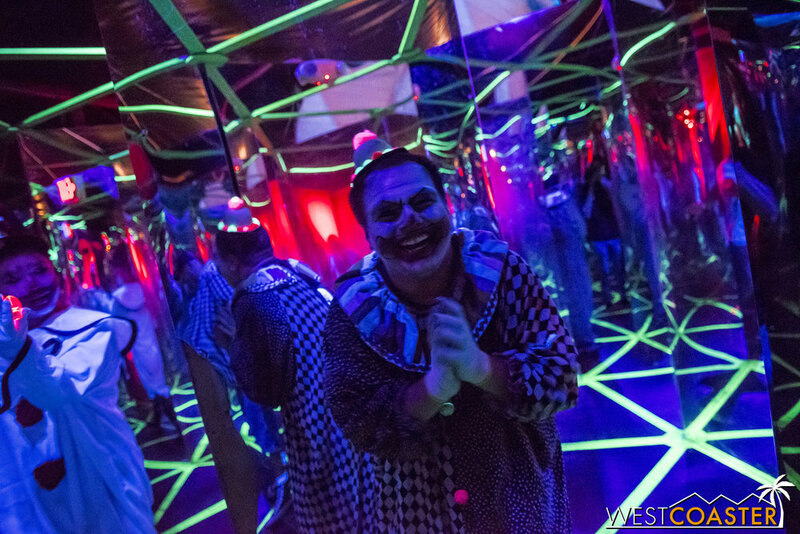 The mirror maze segment also returns, providing confusion to guests who can legitimately become disoriented within it! Traditional favorite elements have not gone away, though. 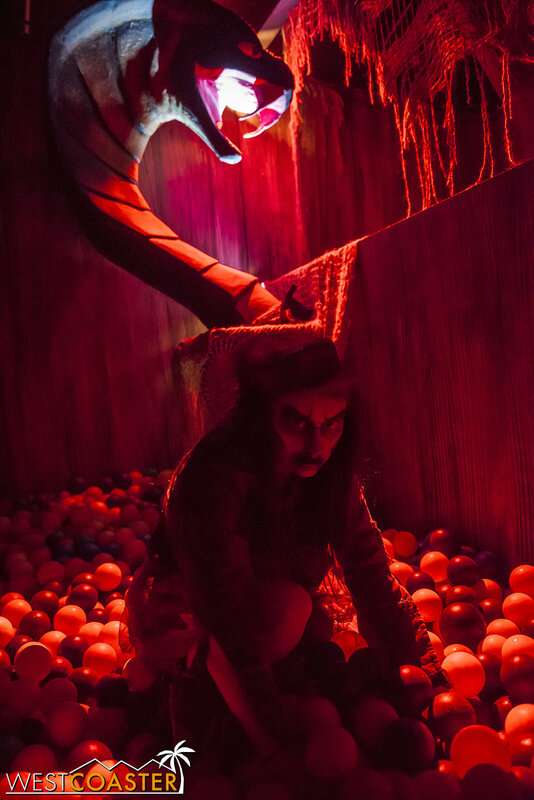 Back is the ball pit, an element that met great acclaim when it debuted three years ago (though it is disappointingly shallow this year and less filled with balls than in the past; in a comedic twist, however, balls litter pretty much every scene of the rest of the maze). The maze of mirrors provides a plethora of confusion to guests who can legitimately run themselves in circles. And Circus also contains a hidden bar—again marked by an insignia matching that on a token that a street monster might distribute. 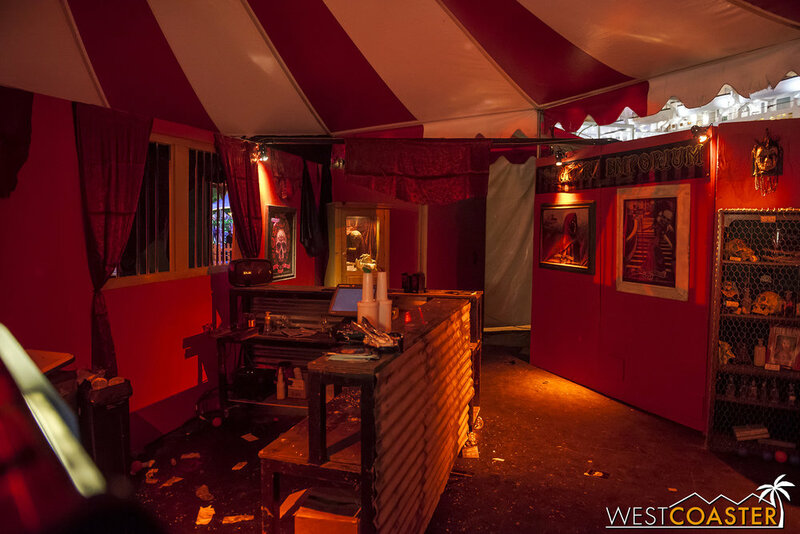 Aesthetically, Circus’ bar is the best themed and most atmospheric out of all the hidden maze bars. Somewhere around this room, guests may encounter a secret entrance for the secret bar. 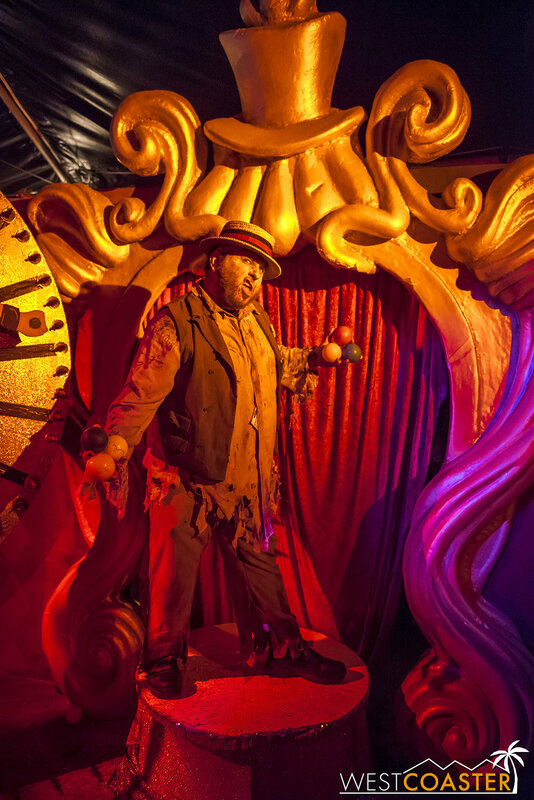 From a theming perspective, Circus feels stepped up from past years, with that additional level of sophistication that comes from getting the Plague Productions treatment. The result is an enjoyable and fun maze, even where it is not particularly scary. 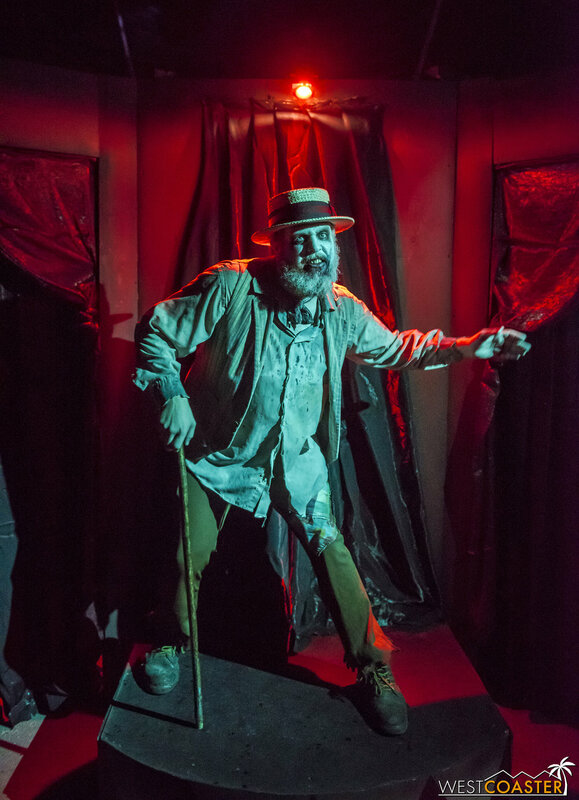 One enters and leaves Circus feeling a sense of glee, which is appropriate, because… clowns. 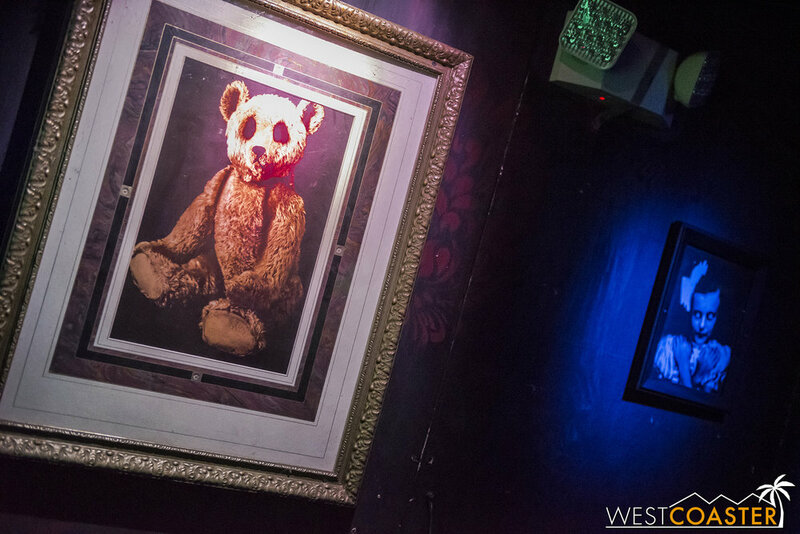 Circus’ Sidebar bar after hours. 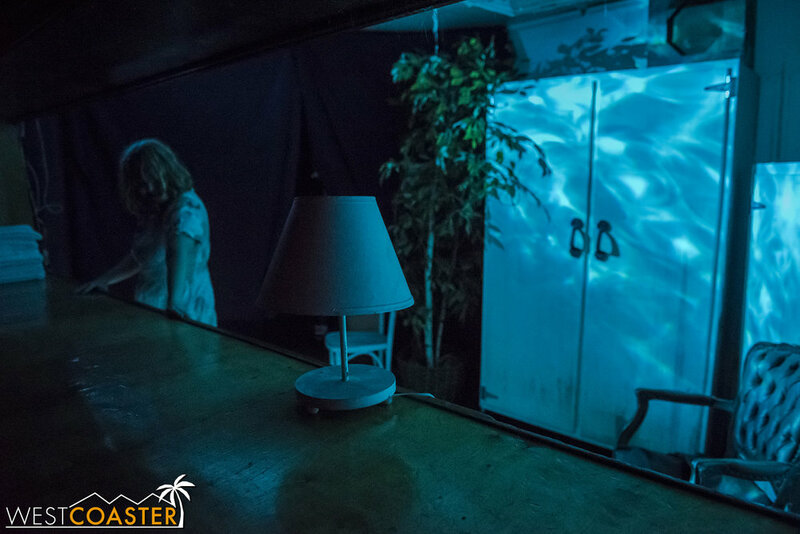 Last year’s new maze was another area of attention, because while it wasn’t particularly terrible in 2017, it was rather lackluster—a generic offering with a typical and predictable cannibal theme. A chef on the Queen Mary who likes to murder and cook his victims? Well, clearly, there will be a strong slaughterhouse aesthetic, and body parts in kitchenware and such. The theming in Feast has been enhanced and made to look even more disgusting. It’s so wrong, but this is still one of my favorite themed element in any haunted maze. This year’s version features some solid improvements to the maze design and progression (especially given its relocated site), though the general story remains roughly the same. Instead, of altering the narrative, the attention has been more to up the detail and gore level, creating some hideously disturbing scenes. A disgusting dinner, a kitchen from hell, and a crawl through a food processor tunnel? Check. Step into an oven after coming face to face with Chef himself? Check. Unlucky guests will have to crawl through a tunnel normally reserved for slaughtering livestock. Chef greets guests right before the oven. But there are also elements to the maze that don’t quite make sense and appear to be where the effort and time and attention ran out. The latter half takes guests through the Queen Mary’s engine room and propeller room, which are really cool and genuinely eerie and unsettling spaces. But they have nothing to do with the theme of the maze. They’re simply there. And while the couple of monsters positioned save the spaces from being total wastes, from a storyline perspective, it doesn’t quite compute to go from kitchen and dining ambiance to rooms related to the ship’s propulsion. A monster waits for victims in the ship’s admittedly cool-looking engine room. Last but certainly still laudable, B340 was the maze that I found the weakest last year—it’s story having been stripped over the seasons to a condensed iteration with a seemingly reduced cast and less energy. It was a shame to see Samuel the Savage’s background—once one of my favorite Dark Harbor mazes—fall to such a state. By far the goriest maze at Dark Harbor belongs to B340. We’re talking Halloween Horror Nights level gore! And a mysterious ghostly killer. This year, B340 has been retooled with the most dramatically revised storyline and an absolutely fantastic opening half that combines new scenes, a terrific soundtrack with dubbed audio, an intriguing and arresting (pun intended) story, and solid scareactor effort to re-energize the maze. Previously, the story of Samuel the Savage basically revolved around a Queen Mary sailor who was too unstable and eventually locked in his room—only to be found having torn himself to pieces in his madness. Older versions of this maze investigated the causes of Samuel’s suicidal insanity and took on a sort of asylum theme, to some respect. Religious iconography finds its way into the B340 maze. The tone of that inspiration remains in 2018’s B340, but Samuel the Savage’s tale takes on more of a film noir case. 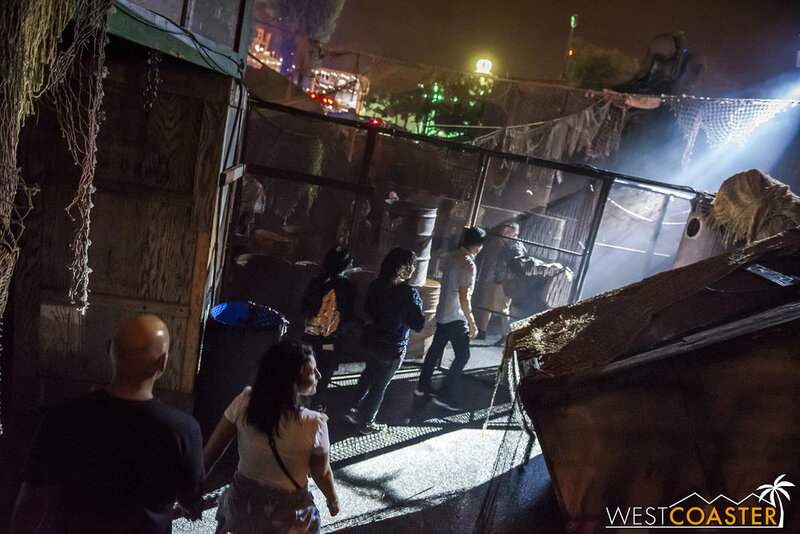 Guests enter upon a grisly crime scene that is the bloodiest and most graphic of any scene at Dark Harbor (it rivals the most brutal that Halloween Horror Nights comes up with). From there, they follow a series of crime exhibits and other murder sites as a detective narrates his progression of leads in the case of strange, beastly Samuel. Rather than someone who kills himself, Samuel is an enraged killer who murders others with brutal ferocity. Or so it seems. There are also nuns involved, invoking a perverted sort of religion as an instigator for murder (think along the lines of The Exorcist in terms of theme), as well as a “Ghostface” (like from Scream—that’s what the design looks like, anyway) masked killer who recurs as a monster coming in with the startle scare. 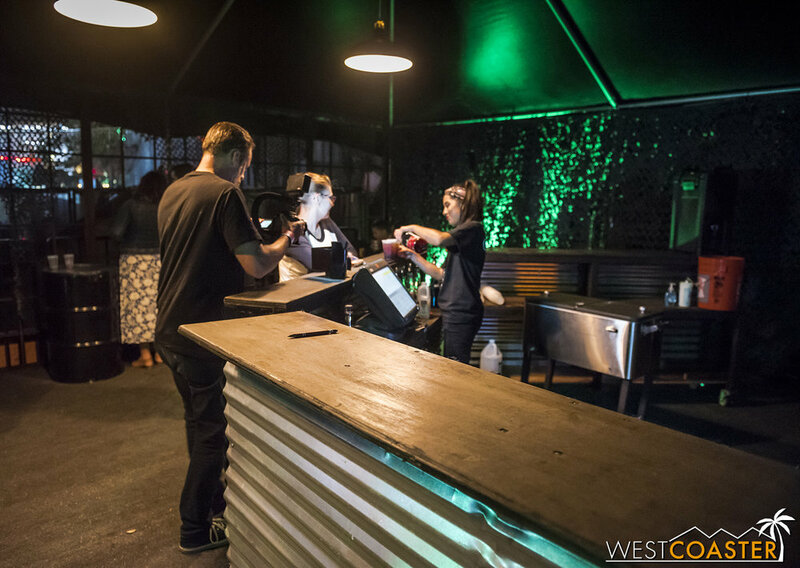 The Lineup Bar is the secret bar within B340, accessible only by a hidden sliding door. Unfortunately, the second half of the maze falls very flat after such an extremely promising opening. In addition to never really addressing who or what “Ghostface” actually is, this part features not only no real improvements but also empty stretches, period. Even the bridge element, which crosses high over a dark cargo space and typically ties to a drop floor prop, did not seem to trigger any effect either time we went through. It would appear that this maze is the point where the team simply ran out of time and resources. And as a result, despite its fantastic first half, it ends up ranked last because of its disappointing ending half. 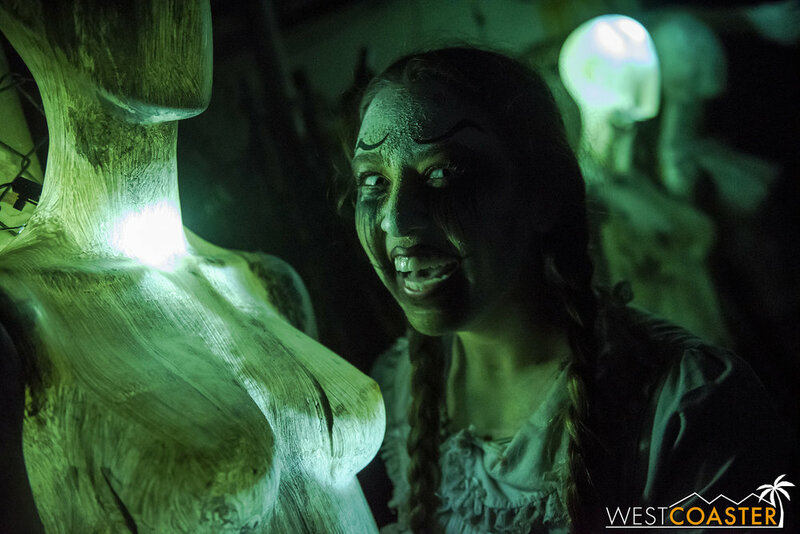 Criticisms aside, overall, Dark Harbor’s mazes were universally impressive to the majority of people I spoke to last Friday, during the event’s media night. 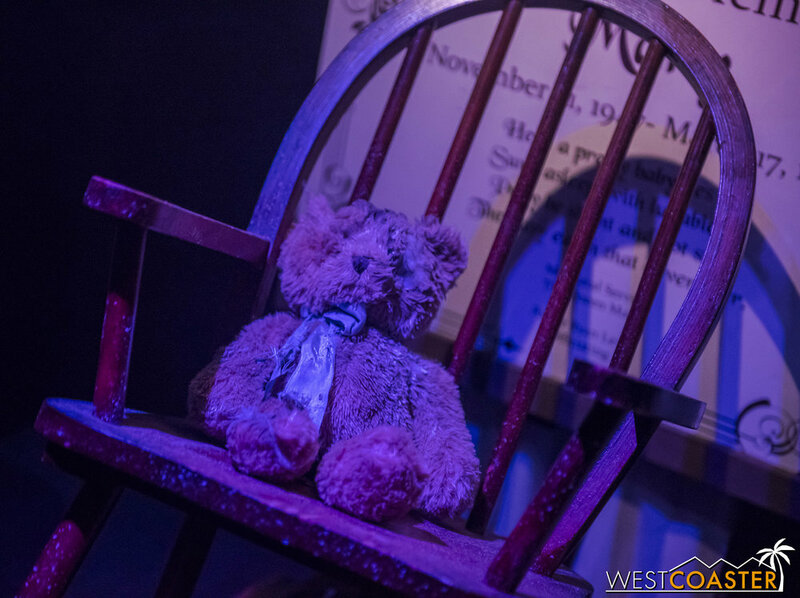 The impact that Jon Cooke and his team have had—working in conjunction with Dark Harbor’s own carpentry and build team—has been clearly evident and very positive. Cooke has been able to fuse his vision and ideas for the event with what is already present and, in less than year, significantly increased the quality and experiences of each of the mazes. 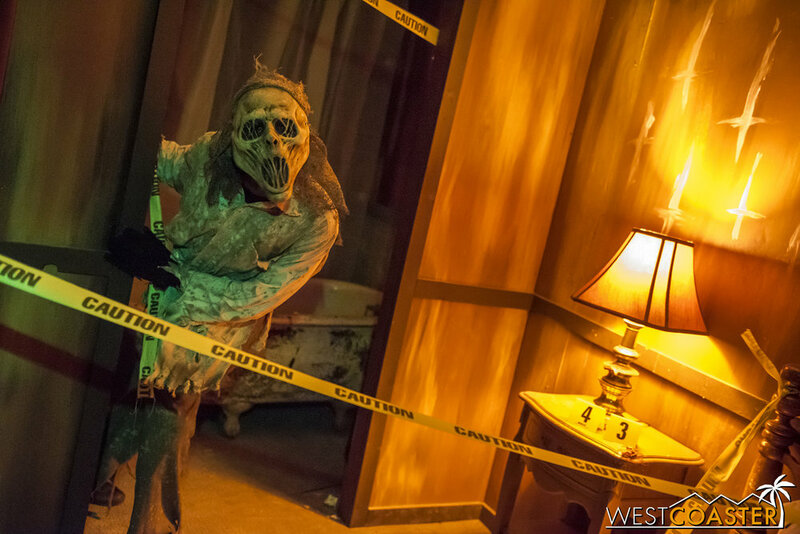 Dark Harbor is carving up more scares than ever. Scary Mary wants more visitors so as to have more playthings. What’s even more impressive is the resources with which Cooke has been working. By now, haunt fans expect Jon to have a magic touch. And while he is a very talented designer, he cannot weave actual magic, especially alone. His team of Plague Productions provides design, visioning, and build services, and they have also worked their butts off to bring all these maze improvements. But there are only about five or six of them total, and maybe another that many on the Queen Mary side. 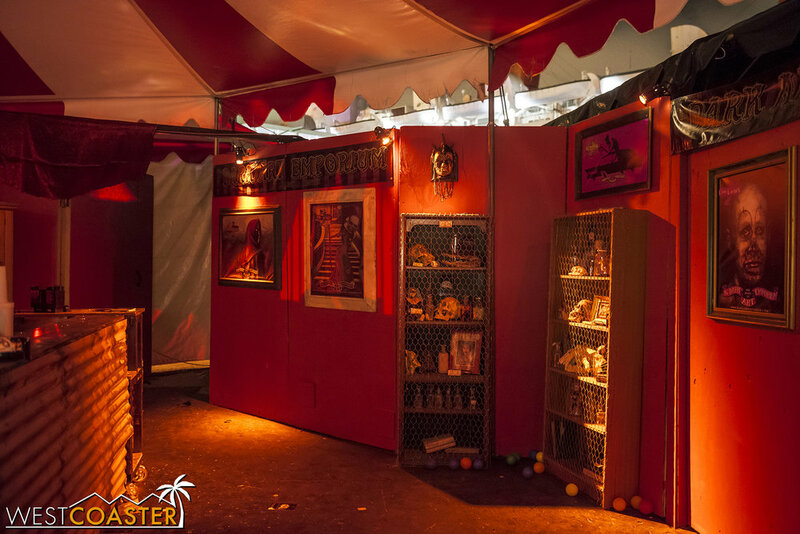 So clearly, while many would hope that Dark Harbor would see an instant improvement to new-Knott’s quality mazes across the board, the reality is that Cooke and his colleagues and the Dark Harbor team were limited by the man hours they could throw. Thus, the level of Intrepid turned out to be different than the level of, say, Feast or B340. And there were gaps in Lullaby where either talent or theming could have been. Lines can get pretty long at Dark Harbor, making it feel more Horror Nights-esque in terms of wait on the worst nights. Fortunately, front of line passes are much more affordable at Dark Harbor relative to most other haunted attractions. It’s okay, though. 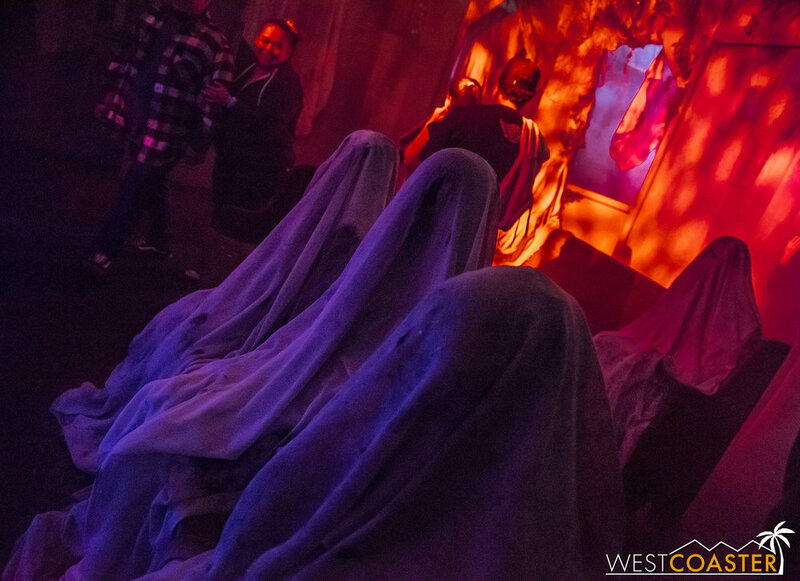 What Dark Harbor has accomplished this year is already tremendous. The great improvement in the mazes means maybe they finally don’t have to rely upon the crutch of more creative alcohol promotions. (It also means expect greater lines for the mazes; I would be remiss to once again highly recommend getting some sort of front of the line pass—either the Fast Fright or even splurg-y VIP Pass—either before arrival or as an on-site upgrade.) And the results in 2018 also bring promise to how much more Dark Harbor can improve next year, when Cooke and company will have a full year under their belt developing and constructing even more advancements for the event. 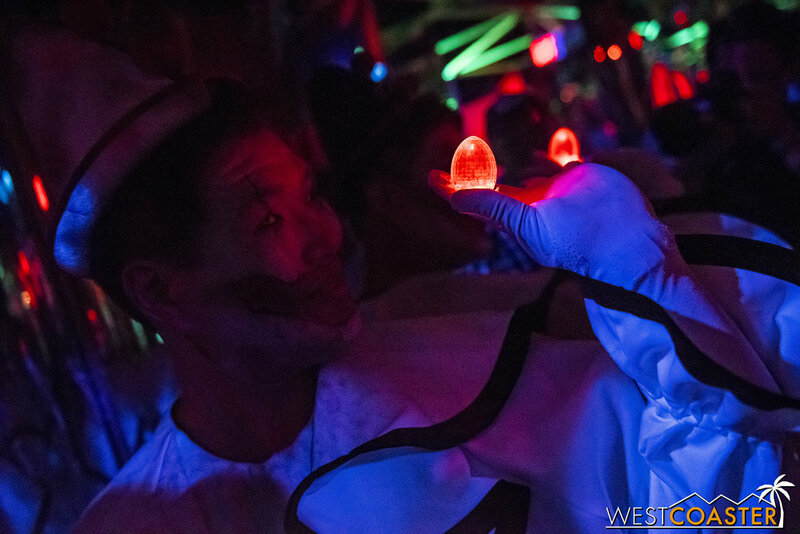 Last year, Dark Harbor needed to up its quality to maintain competition with the rest of the big boys. This year, it has done exactly that. Bravo, to everyone involved, for a job well done! 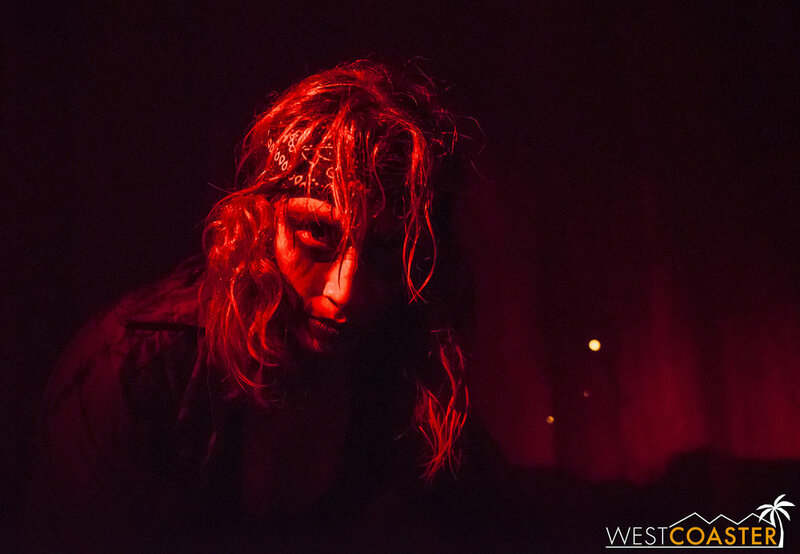 Dark Harbor has cooked up quite a production this year!